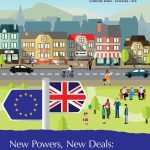 This report, and the summary report, Remaking British Towns after Brexit: Key Actions for Policy Makers and Planners, explore the links between Brexit and towns. The research found that towns that are either (economically) disadvantaged or have grown too fast for services to keep up were those that voted to leave the EU, and are those most likely to suffer the worst consequences. The report looks at what leaving the EU means for towns’ economies and wellbeing, and argues that policy makers need to pay more attention to towns and to develop innovative ‘Towns Deals’.